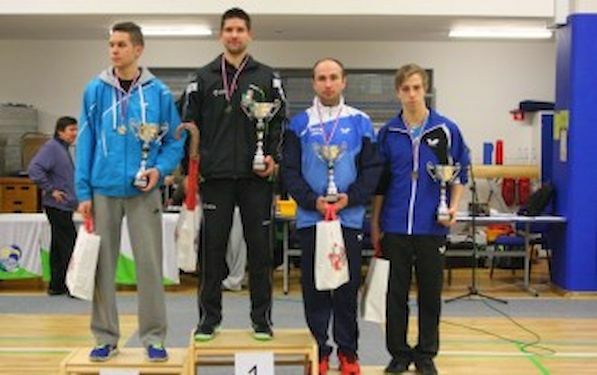 At the last weekend’s national championships in Slovenia 34 year-old Uros SLATINSEK beat Jan ZIBRAT in the final of men’s singles event 4:2 (5, -10, -8, 6, 8, 9). SLATINSEK who has been in the National team for more than 10 years finally secured his first singles crown after having previously won 2 doubles and 1 mixed doubles titles and falling at the finals hurdle in the singles event no less than 3 times (twice against Bojan TOKIC and once against Mitja HORVAT). In the women’s singles event Manca FAJMUT managed to retain her title that she won last year. This time it was the defensive skills of Jana LUDVIK who pushed FAJMUT to the very edge but when the players came back to the table after the towel break at scores tied at 9:9 in the deciding seventh set, it was FAJMUT who showed more composure and won by the narrowest of margins with 4:3 (-9, 8, -5, 6, 8, -6, 9). History was made in the men’s doubles event where Uros SLATINSEK partnered Darko JORGIC to win the title after having saved 8 match points in total in their quarterfinals and semi-finals matches. JORGIC, who clinched 3 medals in cadet events at last year’s EYC in Ostrava, became the youngest senior national champion in the history of Slovenia with the age of 15 years and 7 months. Tjasa ZALOZNIK and Alex GALIC, who this year trains at the Werner SCHLAGER Academy, won the title in women’s doubles event and the mixed doubles event saw Gregor ZAFOSTNIK and Zala VERONIK clinch the title after saving 2 match points in the deciding fifth set of the final.